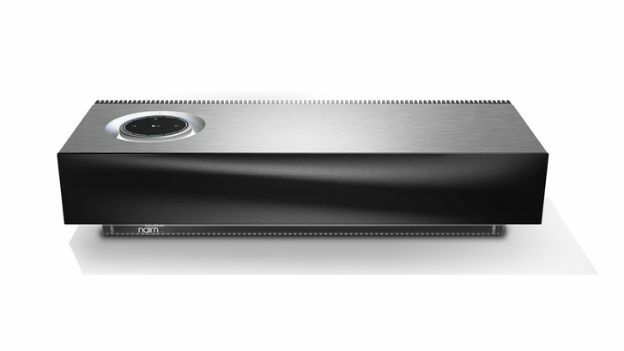 Naim Audio's new Muso music system is a premium swiss army knife of audio goodness. Working ostensibly as a wireless speaker system, it also has a built-in loudspeaker and every kind of connection you could want. Under the solid aluminium chassis, there are six 75-watt digital amplifiers boasting 450W of power that'll play 24bit/192kHz high resolution audio from a range of formats including FLAC, WAV and, of course, MP3. However, it also connects to other Naim systems and acts as a multi-room streamer similar to Sonos using either Apple or Android devices. The connectivity on board includes Apple's AirPlay, Bluetooth and Universal Plug 'n' Play as well as traditional USB, 3.5mm and Ethernet. It offers support for streaming services like Napster or Spotify and internet radio too. Outwardly, Naim says the aluminium has been bead-blasted and anodised to "maximise thermal performance, longevity and, above all, sound quality." The company isn't without a sly sense of humour either, as the touch-sensitive illuminated volume control will go up to 11. Launching in September the Muso will set you back £895.